Let Uber help you party hop all weekend long. Use code CLTAgenda17 for $20 off your first ride. Friday: 79. Sunny. 10% chance of rain. Saturday: 79. Partly cloudy. 10% chance of rain. Sunday: 77. Mostly cloudy. 10% chance of rain. Pumpkin. Spice. Cider. at Red Clay Ciderworks: The cidery has added chai spice, brown sugar and actual pumpkin to its apple cider. 3-11 p.m. Free. Details. Benefit for Puerto Rico at Comic Girl Coffee: Grab a vegan snack and a drink and know you’re doing some good, as all proceeds benefit the Puerto Rico Direct Action Bike Squad, which is aiming to help delivery disaster relief supplies by bike. 6-9 p.m. Free. Details. Charlotte Black Restaurant Week Food Truck Friday at Three Spirits Brewery: Expect live music, vendors and food trucks at this family-friendly event. 6-10 p.m. Free. Details. UNC Charlotte Homecoming at UNC Charlotte: They’ll have a parade, a union takeover and a football game. Friday (4:30 p.m.) and Saturday (6:30 p.m.). Free. Details. Paranormal Grounds Investigation at Historic Rosedale Plantation: Join a group of professional ghost hunters and explore the grounds of Rosedale’s 200 year old plantation while you attempt to contact the beyond with technology from the Charlotte Area Paranormal Society. Friday and Saturday at 8 p.m. $15. Details. Mobile Free Pharmacy at Project 658: Receive free health screenings and choose staples like cold and cough medicine, allergy medicine and vitamins from the medicine cabinet on a first come, first served basis. 18+ only. 9 a.m.-2 p.m. Free. Details. Science on the Rocks: Fright at the Museum at Discovery Place Science: Take part in a Fear Factor Challenge, conduct spooky science experiments, experience a haunted virtual reality experience, dissect a zombie and more. 5-9 p.m. $10-$12. Details. Halloween Swing at Gottaswing: Enjoy a Halloween dance perfect for experts and novices alike. No experience or partner required, but costumes are encouraged. 7-11:30 p.m. $5. Details. Glow Party at Duke Mansion: Enjoy oversized outdoor games, dance-themed video games, black light dancing, a silent auction and food and drink from Mansion Chef Harrison Booth. Proceeds benefit the Mansion. 8 p.m. $75. Details. Creative Midnights at Museum Tower Uptown: Creative Mornings is starting their party after dark. They’ll have a short presentation on the theme “Pioneer” and follow it up with mingling, dancing, eating and drinking. 8-11 p.m. Free. Details. Harry Potter and the Sorcerer’s Stone In Concert at Ovens Auditorium: Relive the magic of the first Harry Potter film on a high-definition screen while the orchestra performs the score live. Friday through Sunday. $20+. Details. Charlotte Ballet’s Fall Works at Knight Theatre: Join the Charlotte Ballet for their Fall Works performances, featuring three unique pieces celebrating the company’s legacy and a look at the future. Evening and matinee performances with special pre-show activities and discounted children tickets. Friday and Saturday. Times vary. $25+. Details. Art Unleashed at C3 Lab: This annual art-sale fundraiser benefitting the Charlotte area animal welfare organizations. 5-7 p.m. Free. Details. Paint and Play at Apostrophe Lounge: Expect spoken word, live painters, line dancing, music, free vacation giveaways, free massages, free cupcakes and a live fashion show. 6-10 p.m. Free. Details. Art in Motion at Coco and the Director: Kick off the weekend at open mic night with live poetry, music, a visual artist and $5 glasses of wine and $4 beers. 7-9 p.m. Free. Details. Cyclofest at the US National Whitewater Center: Expect activities for all ages, including a cyclocross race, educational clinic and a kids’ bike rodeo along with live music, food and drink. Friday-Sunday. Free. Details. NBA Basketball at Spectrum Center: Watch as the Hornets take on the Atlanta Hawks 7 p.m. $15+. Details. Soccer at Irwin Belk Track and Field Center/Transamerica Field: Cheer on the 49ers men’s soccer team as they take on South Carolina. 7 p.m. $5. Details. Sweetest Day at Charlotte Regional Farmers Market: Treat yourself to freshly baked cookies, brownies, pies and more. 8 a.m.-2 p.m. Free. Details. 24th Annual Apple Harvest Festival at Windy Hill Orchard: Expect multiple hard cider bars, hayrides, cider donuts, live music and more. 10 a.m.-6 p.m. $8. See our guide to the event here. Pizza Fest at Libretto’s Pizzeria: Enjoy classic slices and new flavors along with drink specials. Expect live music and prizes, too. 12-9 p.m. $12 for 1 or $20 for 2. Details. Pumpkin Beer Fest at Carolina Beer Temple at Ayrsley: Enjoy four types of pumpkin beers as well as discounted pints and flights. 12 p.m.-12 a.m. Free. Details. Surrender the Booty Bar Crawl in Uptown: This pirate-themed bar crawl goes to 13 of Charlotte’s best nightclubs and bars. Costumes are highly encouraged. 12 p.m.-2 a.m. $40. Details. 3rd Annual Stonewall Flip Cup Tournament at The Bar at 316: Relive your college glory days for a good cause with a tournament, food and drink specials. Registration begins as 12:15 p.m. $10 donation (proceeds benefit Stonewall Sports). Details. Oktoberfest at Whooli’s Bar and Grill: Enjoy a dunk tank, snow cones and German food and beer. 1 p.m. Free. Details. Dogtoberfest at Heist Brewery: They’ll have live music, two rescues with adoptable dogs on site and local vendors and artisans for a day full of pups and brews. 2 p.m. Free. Details. 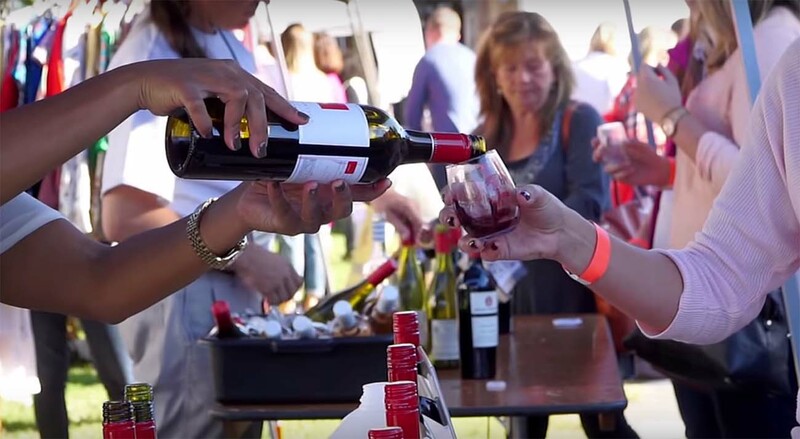 Greystar South End Wine Fest in South End: Enjoy unlimited tastings from 25 different vineyards, live music and food trucks. 2-6 p.m. $35+. Details. Friends and Beerfest: Harvest Edition at Legion Brewing: Enjoy the new Cinn City and Late Tates with Nate, two new fall-flavored brews, pumpkin painting, kids’ games and more. Great Wagon Road and Good Road Ciderworks will both be onsite. 2-7 p.m. Free. Details. Loaves and Fishes Food Drive at Legion Brewing: Donate canned goods and non-perishable items for a free pour of Dos Amigos. 2-11 p.m. Free. Details. Oktoberfest at UNC Charlotte – Hauser Alumni Pavilion: Show your Niner pride at UNC Charlotte’s most popular Homecoming event and drink a lineup of local beers. Admission to the game is included with cost of an adult ticket. 3-6 p.m. $10-$50. Details. Food Truck Rally at Prosperity Village: The last rally will include food, live music and a costume celebration. 4-9 p.m. Free. Details. Moo and Brew Fall Festival at Moo & Brew: Expect live music, drink specials, a pumpkin painting contest, dog costume contest and a pumpkin pie eating competition. 5-9 p.m. Free. Details. Pink Bar Crawl at Rooftop 210: Join thousands of Breast Cancer Awareness supporters to help fund the Pretty in Pink Foundation as you bar hop. Wear your best pink outfit! 6 p.m. $12. Details. For the Love of Bourbon at The Bellè Grille: Enjoy signature bourbon cocktails, bourbon-inspired dishes and live music. 7-11:30 p.m. Free. Details. UNC Charlotte’s Green and White Social at All American Pub: Celebrate Homecoming and join the Young Alumni Chapter and graduates from the last decade as they host the Green and White Social at All American Pub. Cost of admission includes 2 drink tickets and light appetizers. 7:30-10:30 p.m. $15+. Details. Gun and Knife Show at Park Expo and Conference Center: They’ll have hundreds of tables set up so you can browse the best in the business. Saturday (9 a.m.-5 p.m.) and Sunday (10 a.m.-5 p.m.). $8. Details. Homecoming at Johnson C. Smith University: Tailgate, enjoy a parade, take in a football game and more. All day. Free. Details. Muggles Market at NOAH’s Event Venue: Browse and buy from 40 hand-picked vendors at this “Etsy for geeks.” They’ll have items from all fandoms, not just Harry Potter. 10 a.m.-4 p.m. Canned good or $2 donation. Details. Fall Tent Sale at Stilo by EMC Design: Shop serious deals on home decor items featuring furniture, accessories, lamps, mirrors and more outside under the tent. The showroom will be open as well for you to browse and meet their interior designers. 10 a.m.-2 p.m. Free. Details. Day Of Beauty at Haven Spa Boutique: Breast cancer and domestic abuse survivors will receive spa treatments, goodie bags, breakfast and lunch. 10 a.m.-3 p.m. Free. Details. Tent Sale and Pop-Up Market at Sardis Marketplace: Browse and shop local used goods, listen to live music, eat great food and try your luck at winning a giveaway. 10 a.m.-4 p.m. Free. Details. Annual Holiday Open House at John Dabbs, Ltd.: Celebrate 45 years of gifts and personal service with light bites, mimosas, bloody marys and more. 10 a.m.-5 p.m. Free. Details. NoDa Superflea at NoDa Company Store: The Company Store’s first ever superflea market will feature vendors selling vintage items, clothes, furniture, records, art, custom jewelry and more. 10 a.m.-5 p.m. Free. Details. Psychic Fair at Sanctuary Imports: Find out what’s in store for you with 10+ readers on site. 1-5 p.m. Price varies by reader. Details. GUTS at BB&T Ballpark: The annual pumpkin carving contest is back with music, food, beer, trick-or-treating, a photo booth and Make-A-Wish Wish Kids. 2 p.m. $10. Details. Carved at Lenny Boy Brewing Co.: Tickets include food, drink and entry into the pumpkin carving competition. They’ll also have vendors and kids activities on site. 3-6 p.m. $20. Details. Betty Bash at NoDa Brewing Company: This donation-based fundraiser benefits JDRF, an organization dedicated to funding Type 1 diabetes research. Expect live entertainment, games, a silent auction and food and drink. 5-10 p.m. Donation-based. Details. Brewer’s Ball at Discovery Place Science: Imagine the traditional beer festival moved inside and dressed up. Tickets include unlimited samples from breweries, cideries, wine distributors and restaurants. Proceeds benefit the Cystic Fibrosis Foundation. 7-11 p.m. $75+. Details. Guys with Ties Casino Night at Harvey B. Gantt Center for African-American Arts + Culture: Enjoy live music, 3 levels of parties, casino games, all-you-can-eat and drink and a silent auction. Proceeds benefit The Isabella Santos Foundation. 8 p.m.-12 a.m. $75+ (use code ‘panthers’ for a VIP ticket at general admission cost). Details. All Hallows’ Twirl 2017: “Fright Night” at Flight: Expect drink specials, a $500 costume contest and more. Costumes encouraged. 10 p.m.-2:15 a.m. $15-$20. Details. ARC Wildlife Rehabilitation Training at 4101 Freedom Drive: Interested in wildlife rehabilitation volunteer work? This two-day training class will covers all the basic information and skills you need to get started. Saturday (10 a.m.-6 p.m.) and Sunday (1-7 p.m.). $75. Details. Day of the Dead Pre-Workshop at Harvey B. Gantt Center for African-American Arts + Culture and The Bechtler: Learn about the history and traditions of the Mexico’s Day of the Dead holiday and then make traditional tombstones and relics. 11 a.m.-3:30 p.m. Free. Details. Drink in the Knowledge at Free Range Brewing: Learn the ins and outs of being a first-time home buyer while you enjoy a cold beer. 12-2 p.m. Free. Details. DIY Workshop at Hygge Coworking: Learn the basics of hand lettering and then put your new skills to use by creating a chalkboard sign with a custom message. 1-3:30 p.m. $42. Details. Black Alternative Music Festival at Camp North End: Enjoy the first ever [BLA/ALT] to celebrate the those who continue to pave the way in the music world. 12-11 p.m. Free. Details. Free for ALL Art Exhibit at Hart Witzen Gallery: This diverse and inclusive visual arts exhibit will feature recent works of both Hart Witzen studio artists and regional artists and include a behind-the-scenes look into some of the work. 7-11 p.m. Free. Details. Viva Boogaloo at Morehead Tavern: Enjoy South American music, shop local vendors and take dance lessons. 9 p.m.-2 a.m. $10. Details. Love and Laughter Hurricane Relief Benefit at Charlotte Comedy Theater: The theater’s award-winning improv comedy shows will be performing. All proceeds will be donated to a charity that is directly helping the people of Puerto Rico. 10-11:30 p.m. $10. Details. All Hallows Eve Family Day at Historic Latta Plantation: Don your best costumes for a day of trick-or-treating, games, historical demonstrations and farm animal meet and greets. 10 a.m.-2 p.m. $9. Details. Fall Fund Day at Hall Family Farms: Take hayrides, take on their famous corn maze and pick pumpkins. 1-4 p.m. Free. Details. Teddy Bear Picnic at Reedy Creek Park and Nature Center: Kids can bring their teddy bears and a bagged lunch for a picnic, story reading and nature walk. 2-3 p.m. Free. Details. Arboretum Tricks ‘n Treats at The Arboretum Shopping Center: Meet superheroes, check out pumpkins pumpkins, creepy crawlies, face painting and eat lots of candy in your best costume. Proceeds from the pumpkin patch will benefit the Autism Society of North Carolina. 3:30-6 p.m. Free. Details. CF Cycle for Life at Draught: Bike the outskirts of Charlotte on 15-, 35- and 70-mile loops before celebrating at the after party. All proceeds benefit the Cystic Fibrosis Foundation. 7 a.m.-4 p.m. $35. Details. Rocktoberfest at American Legion Memorial Stadium: Run a half marathon or 9k while you listen to live entertainment. 7:40 a.m. $35+. Details. Healthy UCity Race Series: Race for Hope 5k at University Research Park: This is the next race in the Healthy UCity Race Series and it features a 5K and a Kids’ Fun Run. It will benefit Queen City Jack and Jill, an organization that aims to give children the guidance and opportunity to develop leadership skills. 8 a.m. $15-$35. Details. PureBarre Popup at Whole Foods and CYCLEBAR Waverly: Start the sweat session with a barre class at Whole Foods and follow it up with a 50-minute ride at CYCLEBAR. 9:45-11 a.m. Barre is Free. Details. Harry Potter Yoga at Cotton Branch Farm Animal Sanctuary: Enjoy a fun and relaxing Harry Potter-themed yoga event. Proceeds support the Sanctuary’s animals. 1:30-3:30 p.m. $30. Details. Rugby Triple Header at Charlotte Rugby Club: Come watch both D3 and D2 games against Asheville and Columbia Olde Grey. 11 a.m., 1 p.m., 3 p.m. $5. Details. Charlotte Independence Playoff Watch Party at NoDa Brewing Company: Cheer on the Independence as they take on the Rochester Rhinos away in the first round of the 2018 USL Playoffs. 6 p.m. Free. Details. Homecoming Football Game at UNC Charlotte Jerry Richardson Stadium: Enjoy tailgating and a Niner Walk before the game. Tailgating lots open at 2:30pm and the Niner Walk starts in front of the Hauser Alumni Pavilion at approximately 4:19 p.m. Game begins at 6:30 p.m. $20+. Details. Brunch and Brews at Legion Brewing: Enjoy brunch, $4 beermosas and cold brew and pour-over coffee from Undercurrent. 10 a.m.-2 p.m. Free. Details. Boo Brunch Spectacular at Petra’s: Enjoy tricks, treats and wares from local artists, as well as crafts to being out your inner DIY demon. 11 a.m.-3 p.m. Free. Details. Family Time at City Barbeque: Get a free kids meal with the purchase of an adult entrée. Proceeds from any chocolate cake purchased will benefit the American Cancer Society. 11 a.m.-10 p.m. Adult meal must cost $7+. Details. Howl-o-ween at Birdsong Brewing Co.: Join the North Mecklenburg Animal Rescue for an afternoon with a pet costume contest, adoptable dogs a raffle and live music. 4-7 p.m. Free, save for $5 raffle tickets and the donation-based costume contest. Details. Burly Wine Dinner at Napa on Providence: Savor four courses with four perfectly paired wines hosted by Burly Wine maker Hank McCrorie. 6:30 p.m. $125++. Details. Natural Happenings: Birds of Prey at McDowell Nature Preserve: Join a naturalist to learn about the birds of prey through an animal encounter. Bring a water bottle and wear comfortable shoes. Registration required. 2-4 p.m. Free. Details. Laugh Your Tail Off at The Comedy Zone: Enjoy a silent auction, 50/50 raffle and live auction followed by a performance by Julie Scoggins. Proceeds benefit GCSPCA Emergency Vet Care Fund. 18+ only 5:30 p.m. $20. Details. Boo Bash at SouthPark Mall and Symphony Park: Activities include trick or treating, a costume parade with prizes, arts and crafts and more. RSVP to be entered in door prizes. 1-5 p.m. Free. Details. Biketoberfest at Triple C Brewing: Explore the city without getting in your car and end at Triple C for raffles and live music. 11:30 a.m.-6:30 p.m. $25. Details. Black & Blue Blaze Tailgate at Blue Blaze Brewing: Enjoy lawn games, discounted pitchers and a showing of the Panthers game on a 12-foot screen. 12-8 p.m. Details. GOP Panthers Watch Party at Mecklenburg County Republican Party: Help make calls, bundle materials, make signs and send out letters while cheering on the Panthers. 1-4 p.m. Free. Details. Panthers Watch Party at Helles & Dunkel: Enjoy a free cookout before the game along with beer specials all day. 1 p.m. Free. Details. Women’s Soccer at Irwin Belk Track and Field Center/Transamerica Field: Cheer on the 49ers as they take on Rice University 1 p.m. $5. Details. Volleyball at Dale F. Halton Arena: Cheer on the 49ers as they take on North Texas. 1 p.m. $5. Details. Burly Wine Dinner at Ruth’s Chris Steak House SouthPark: Indulge in a multi-course meal in which each course has been paired with a wine by Burly Wine owner Hank McCrorie. November 3. Charlotte Marathon in Uptown: Choose between running a full or half marathon, 5K, relay or kids’ 1-mile and celebrate crossing the finish line with a festival at Romare Bearden. November 10-11. Trevor Noah at Knight Theater: Laugh with The Daily Show and Netflix comedian as he discusses any and everything. February 24. Feature photo via South End Wine Fest. Alivia McAtee contributed to this story.